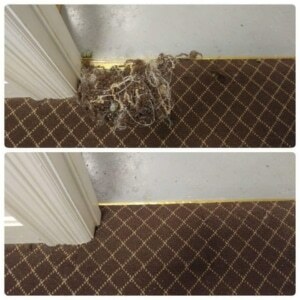 We all love our pets but sometimes they get scared or bored, and even mischievous, which can wreak havoc on our carpets. The most common phone call we receive at The Carpet Chemist is when a customer calls to tell us about their dog or cat that was accidentally locked inside the bedroom with the door closed, and the pet tried digging their way out. Perhaps company came over to visit for a bit, and their puppy couldn’t go outside because it was raining, so the only option was the bedroom. Or maybe they accidentally got locked in the bedroom when their parents went to work and closed the door behind them. Whatever the situation, whatever the reason, we can help! It’s what we do.